Locking TV Stand on Wheels - 60" - 100" - AV Case ¦ Ships Same Day! This mobile television cart, locking TV stand secures electronics peripherals and more, making it ideal for use in public places without the need for constant supervision! 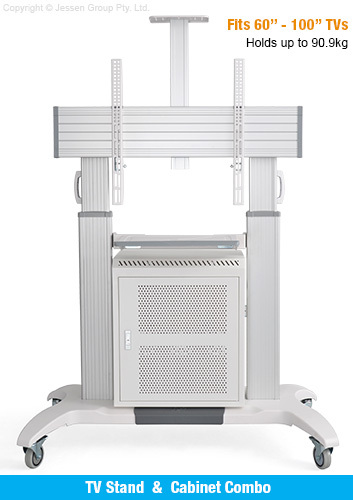 This mobile stand has an lockable AV cabinet with adjustable shelf for placing devices, with the breathable steel make designed to prevent overheating of components. The white finish complements the television trolley, and knock-outs in the rear making threading cords out simple. The flat panel stand features cable management as well, with rubber gaskets on cut-outs helping to maintain a tidy appearance with minimal power cord and AV cable visibility. The locking TV stand features (4) wheels on the base to make moving it across rooms and into position easy for retail stores, exhibition halls, shopping centres, museums, universities, and more. Handles built-in to the side provide a grip, and each castor is lockable to prevent the fixture from sliding out of place. This lockable flat panel stand is designed to hold 60" to 100" televisions weighing up to 90.9kg. A universal mount works with most makes and models of screens, with 200 x 200mm through 1000 x 600mm VESA hole patterns being compatible. The (2) columns of the display are height adjustable, able to be changed in 50mm increments between 1390 and 1740mm to allow you to centre the screen for best view. These stands have (2) shelves with different purposes: one above the screen for holding webcams up to 4.5kg, and an adjustable shelf below the screen for items up to 11.4kg. Made from aluminium alloy, this display has a white and grey finish, a neutral look that works well in any décor. The base is powder coated steel to hold most of the weight to ensure stability. Order today by 2pm EST to receive same day Australia-wide despatch with this and most other products when in stock, only from Slimline Warehouse!